If you miss a day during the week feel free to hit up open gym! The Holidays season has begun! I cannot even begin to tell you how excited I am for holiday ham and pumpkin pie (now you know the secret to getting me to do just about anything). However with the holiday season many of us might suddenly find our selves in predicaments like, I want this pie but I also want to be able to fit into my clothes come January. Basically we all want to be able to enjoy ourselves but also not completely de rail all of our hard work and energy we have put into ourselves for the last year. Patrick has written about the Holiday Trifecta in the past and there is no better time than now to refresh your memories. The holiday trifecta of disaster is, eating crap, drinking and skipping the gym. You can probably get away with not doing one during the holidays, maybe two but not all three without paying the price. Life is about balance and we want you to enjoy your holidays and not feel like you missed out, but we also don’t want you coming to us on January 1st saying “WHAT HAVE I DONE?” Consider what you can control out of these three. For example, for me, I really just want ham and pie, so I stick to sparkling water and maybe one glass of cabernet, then I make sure to really go hard in the gym. 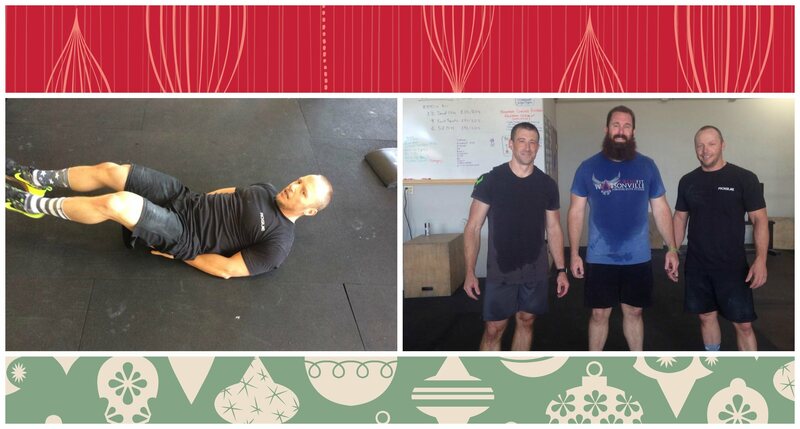 My holiday rule tends to be NO WOD NO PIE. So as much as I want to snooze just a little longer when it gets colder outside, I know getting into the gym will let me have balance. Besides trying to find balance by only picking one vice you can also find try to find balance while eating this season. Control what you can and also allow yourself to enjoy whatever gathering or outing you are out. Your best option is to first fill up on protein and veggies and then sprinkle in the rest. Another tip is to plan ahead, if you know you have a big dinner try to keep all your other meals healthy and light. Don’t forget to hydrate with water; we so often confuse hunger with thirst so make sure even if its cold you are drinking water to stay hydrated. Lastly don’t beat your self up if you slip up. There is no reason to go on a downward spiral just because you chose that extra glass of wine. If you fall into the trap committing the Holiday Trifecta just dust your self off and start again. Commit to hitting the gym, or chose to not drink at the next party you attend, or stick to eating healthy for the remainder of the week. Whatever it is don’t let a slip up turn into a ride down a black diamond slope! Below is our Thanksgiving schedule so that you can hit the gym with us and maybe enjoy your meal a tiny bit more.